Kinds of reasons can be covered to get a free video converter for Mac. You might get a new movie on Mac but can't play it. You're likely to need to compress your video smaller so as to store and play on a limited storage device. You might expect to change a recorded video from a strange format to the one that can be more easily shared with others. Or you just want to encode your HD videos to HEVC codec on High Sierra for playing on your iPhone 8/X and or other modern HEVC players. Whatever the reasons, a free Mac video converter can make all things done. However, many people put off converting videos since it's always mistaken to be complicated. Not really. We will get you through the best free video converter Mac 2018 to convert videos into various formats including MP4, MKV, FLV, MOV, DivX, AVI, AVCHD, WMV, MTS, M2TS and more. 2019 Best Free Video Converter on Mac to Convert MP4, MOV, AVI, AVCHD etc. MacX Video Converter Free wins the top of the best free video converter Mac 2019 since it can handle conversions to everything from VOB to MP4, MKV to AVI, MKV to MP4, M2TS to FLV, AVCHD to HEVC, AVI to MP4 and more than 1000 other input formats all within an attractive and minimalist interface. Users can make video conversion done through drag and drop within three steps only! It serves as 2019 best free video converter to convert videos to MP4, MOV files playable on QuickTime and iPhone iPad iPod or any video audio format. The free MP4 video converter for Mac not only lets you convert videos, but also trim, crop video, add watermark and external subtitle to the videos, customize the video quality. Fast converting speed and best video audio quality guaranteed. With the multi-core CPU (up to 8 cores), high quality engine, you're able to convert videos 15 faster with almost original quality reserved, even if you compress MP4 file size up to 50%. 100% clean and easy to use. The whole converting process can be done within 3 simple steps. Best free video converter for macOS High Sierra. It's perfectly compatible with the latest macOS, including High Sierra, Sierra, El Capitan etc. Though this free video converter for Mac converts videos to most common video formats and runs a fast speed, some users' needs are not limited to these. They want to own more preset profiles, download online videos from YouTube, Facebook, Dailymotion etc., make a photo slideshow, record videos or screen activities or whatever. But there is nothing to be upset! You can move to the advanced MacX Video Converter Pro, which will make all these done! 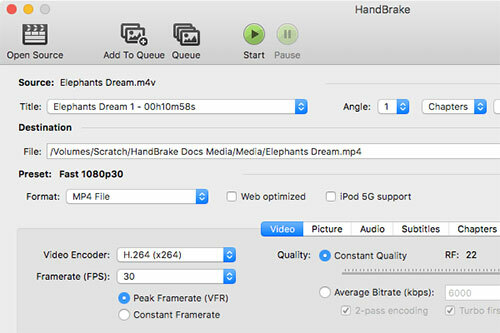 I bet Handbrake is proverbially known to everyone who has ever been interested in video conversion. The superiority of the open source and free video converter comes to function of both converting video files and ripping DVD with Handbrake. Converts video from nearly any format to MP4 or MKV for playback on a number of popular devices, including iPhones, AppleTV, Android tablets etc. It features an abundance of video-editing tools for splicing, adjusting frame rate, and adding subtitles and assorted video effects. You can also view the results in a live preview window before they officially take effect. A multi-platform video converter - compatible with Mac, Windows and Linux. BTW, you need to convert videos with other free video converter macOS High Sierra since Handbrake isn't available on High Sierra currently. DivX Converter never lets you down on converting videos to a number of formats. It comes equipped with DivX profiles for creating DivX, H.264 and HEVC videos compatible with more than 1 billion DivX Certified devices, including DVD players, DVD recorders, portable media players and even mobiles. It offers a simple way to convert digital videos like MOV, FLV, WMV, MP4 to/from DivX media format in high quality. You're able to transcode videos on your own terms with the DivX converter Mac, such as set bitrate, limit video resolution and file size, combine multiple clips or rotate video before you convert. It provides four modes to convert HEVC videos, which gives you even more control over when to maximize quality or prioritize speed. By adding MPEG-2 Plug-in on the free video converter Mac 2019, you'll be able to convert non-encrypted DVDs to DivX for a better digital backup of your personal video collection. 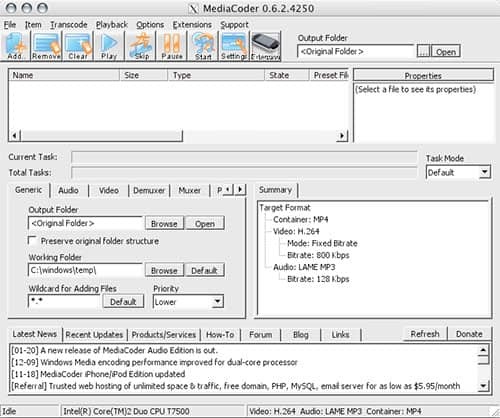 MeidaCoder is a universal free video converter on Mac which features with most cutting-edge audio/video technologies into an out-of-box transcoding solution with a rich set of adjustable parameters. No matter how old and obscure the format of that video you have lurking on an ancient hard drive, MediaCoder should be able to bring it bang up to date in next to no time. It delivers sheer speed to convert videos, thanks to the H.264/H.265 GPU accelerated encoding (QuickSync, NVENC, CUDA). It enables us to convert the videos to MP4, MKV, AVI, FLV, WMV, MOV, etc. formats and enhance audio and video contents by various filters. This free Mac video converter 2019 attaches with extra features such as video joining, sound syncing, aspect ratio adjustment, and much more. Ripping BD/DVD/VCD/CD and capturing from video cameras. MediaCoder is also available on cross platforms, from Mac, Windows to Linux. Online video converters always come to the popular choice for the free video converter. And it cannot be omitted in 2019 as well. Throughout various free online video converters, Online-Convert is definitely qualified within the range of best free video converter Mac 2019. It can convert online video files to MP4, AVI, WMV, TS, Mac's default QuickTime Player format MOV, M4V or other mainstream formats. Both available to convert local video files and online videos from YouTube, Facebook, Vevo, Dailymotion, Myspace and more. The 2018 free online video converter also works well on edit videos like crop, cut, flip, rotate videos and change video bitrate, frame rate, size etc. Yes, adjust parameters like codec, frame rate, quality etc. Yes, change bitrate, resolution, frame rate, codec etc. Yes, adjut bitrate frame rate, codec etc. 2. No bonus functions like download video, record video, make slideshow etc. compared with Pro version. 1. The official page contains ads download button which is easy to be click errorly. 2. Not so fast, it all depends on the Internet. MacX Video Converter Free is rated as the best free video converter for Mac (macOS High Sierra incl.). It converts any SD HD videos with good quality, 5x faster speed than other competitors. No size limits, no ads, no plugin, no extra software.